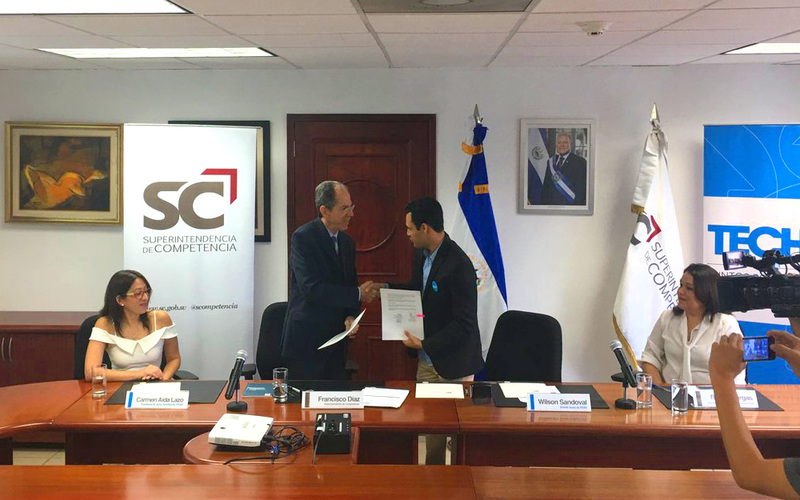 The Superintendency of Competition (SC) and TECHO El Salvador today signed a letter of understanding with the purpose of generating a joint work platform for the promotion of community capacities, in particular, the social defense of competition. In doing so, it promotes the development of a just society, where all people have opportunities to develop their abilities, as well as to exercise and fully enjoy their rights. One of the mandates of the Superintendency of Competence is the public education on competition through the approach to the population, for which creative tools of education and communication have been developed that reveal the benefits of healthy competition between companies. Since last August, the entity has implemented the Public Education Program called “La GiraSC: Fair Markets, Opportunities for All”, within which the alliance signed this day with TECHO is framed. Reporting on the benefits of competition seeks to identify the inhabitants of the communities, from their role in society – whether micro or small entrepreneurs, entrepreneurs, employees or consumers – to identify atypical situations that limit competition. In this way, they can provide indications or report to the Superintendency of Competition on possible anticompetitive practices. Through the signed letter, the Superintendence of Competence will make available to the communities the educational activities of La Gira SC and will develop training days where volunteers from the organization will participate. TECHO, for its part, will act as the link between its coverage populations and the Competition authority. TECHO works to overcome the condition of poverty in the precarious human settlements, through the joint action of settlers, volunteers and sectors that make up society. The organization seeks to promote networking, which is why this collaboration with the Superintendency of Competencies allows information about competition legislation to be brought to the communities. Within the TECHO intervention model, spaces for dialogue are created that allow community leaders to empower themselves and to act on proposals focused on community development. During the first phase of implementation of the activities considered by the agreement, it has been programmed the presentation of puppet theater in nine communities located in different municipalities of the country. With the Gira SC, the Superintendency of Competence continues to promote awareness of the benefits of healthy competition in society among school-age students, university students, micro, small and medium-sized enterprises (MSMEs) and communities. Thanks to the promotion and education activities carried out since August 2016, when the tour was launched, the direct relationship with more than 4,000 Salvadorans has been achieved, bearing in mind the vision of extending coverage during the following months of the year. SC y TECHO se alían por la cultura de competencia.